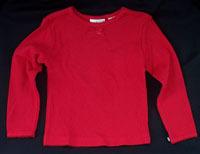 Children's Crew Neck Shirts NOW 70% OFF! These are a great basic shirt for every little girl's wardrobe!! They have long sleeves and a round neck with a little bow. Get one of every color to go with everything! 100% Cotton - so buy a little big as they will shrink a touch. 70% off the original $9 is only $2.70! !